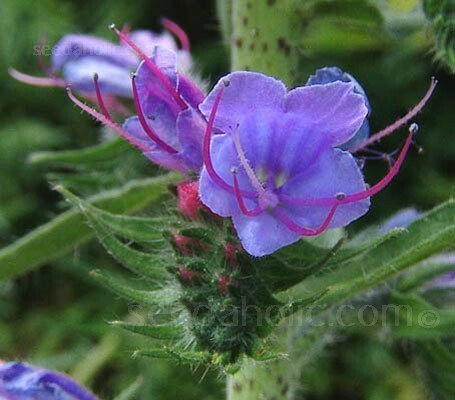 Echium vulgare is a rather exotic native plant which makes a rosette of oblong hairy leaves from which arises a stout flowering spike with blue conical flowers up its length. Each flower has protruding red stamens. Used in the border or as part of wildlife friendly planting schemes, the buds of start off pink at first, the flowers turn the most exquisite shades of intense blue and as the flowers fade they become tinged with crimson. Echium vulgare is a valuable plant and is exotic enough to earn a place in a flower border or used it as near to your allotment to ensure pollination. If you don’t want plants that honeybees simply visit, but want to select plants that honeybees clearly love, choose Echium for your garden. 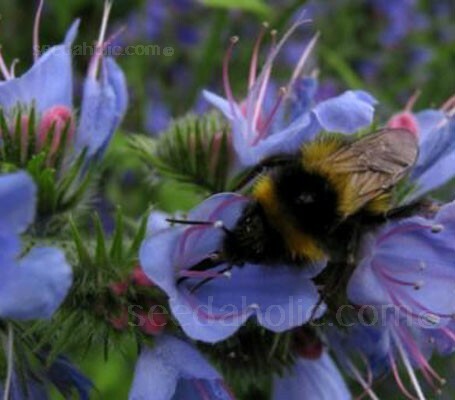 Viper's bugloss is one of, if not THE very best plant to attract bees to your garden. Along with Borage and Phacelia, the plant is much loved by almost all bee species, especially bumblebees. The plant repeat blooms throughout the summer into autumn, providing nectar for bees for overwintering. Unlike many flowers. Echium has a most unusual feature. The nectar inside the flower is protected inside the flower, from vaporization (when it’s hot) or being flushing away (when it rains). This plant produces nectar throughout the day unlike most plants which produce nectar for a short period of time. 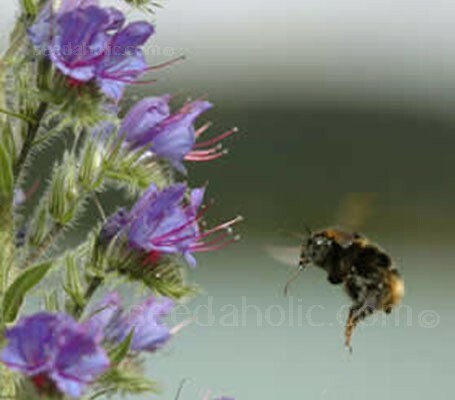 If the bees have a good access to Echium they can collect between 12-20 lbs of nectar a day. The plant continues to bloom throughout drought periods. The concentration of sugars in the nectar varies, from 22.6 to 48.3% depending on the quality of the soil, and not on the amount of rain. Sow March-May for flowers June-September, or sow August-September to flower May-July the following year. 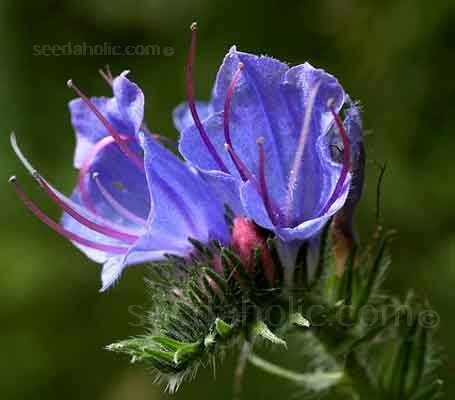 The seed should be sown directly outdoors where it is to flower in spring or autumn. They prefer well drained soil in full sun or part shade. The seed can also be sown indoors, but direct sowing is preferable, as they have a long taproot which can be damaged when transplanting. Make two or three successive sowings for continuous flowers. Prepare the area where they are to grow. Removing any weeds or stones and rake to a fine tilth. Sow thinly, 6mm (¼in) deep in drills 30cm (12in) apart. Sow the seed sparingly or they will choke out other seedlings. Water ground regularly until the seedlings are established, especially in dry periods. Optimum germination temperature: 60 to 65°F (15 to 18°C). If sowing more than one annual in the same bed, consider marking the sowing areas with a ring of sand and a label. The seedlings will appear in rows approx 6 to 8 weeks after planting and can be easily told from nearby weed seedlings. Prick out superfluous seedlings rigorously, so that the plants are at least 38cm (18in) apart. They will then have enough space to spread satisfactorily. This striking species is best viewed and not touched. The sharp spines, which cover the plant, are a powerful deterrent and can be a skin irritant; becoming lodged in the skin much like those of a cactus. If you are tempted by the Viper, please use gloves when handling the plant! Flowers Borders and Beds, Patio/Container Plants, Cut Flower, Wildlife and wildflower meadows. Bees and Honey making. Butterfly gardens, Drought Tolerant. Echium vulgare is a very attractive European native, often found on grassy and undisturbed situations. It prefers a well-drained chalky soil and is often seen on chalk and limestone downs, by the coast on cliffs, sand dunes and shingle. Vipers Bugloss has sadly declined somewhat in frequency, due to agricultural intensification, reclamation and the development of neglected ground. The popular name records its historic use as a cure for snake bites. Culpeper's Complete Herbal (circa 17th century) describes Viper's as follows: "It is a most gallant herb of the Sun; it is a pity it is no more in use than it is. It is an especial remedy against the biting of the Viper, and all other venomous beasts, or serpents; as also against poison, or poisonous herbs. Discorides and others say, That whosoever shall take of the herb or root before they be bitten, they shall not be hurt by the poison of any serpent." Echium vulgare belongs to the Boraginacea family. It is known as Viper’s Bugloss. The genus Echium is named from the Greek echis meaning "a viper," the flowers apparently appearing to represent a viper's head. The name bugloss is of Greek origin, from a word signifying an ox's tongue, and alluding to the roughness and shape of the plant's leaves. The viper part of the name may derive from the spotted stem, said to recall marks on a snake, or an imagined resemblance between the dead flower-head and the head of a snake. Optimum germination temperature: 60 to 65°F (15 to 18°C).